Meet Atticus! He's a handsome 3-4 year old Pit Bull mix. This amazing guy is loves to snuggle and be with his people. He is incredibly friendly and loves getting attention. Atticus is completely house trained. His favorite hobbies include walking, playing with tug toys, and enjoying some lap time on the couch or bed. Atticus is deaf and is prone to sunburns due to his albino skin but he does look like a stud in his t-shirts! He will need someone who can cater to his special needs and give him the forever home he deserves. 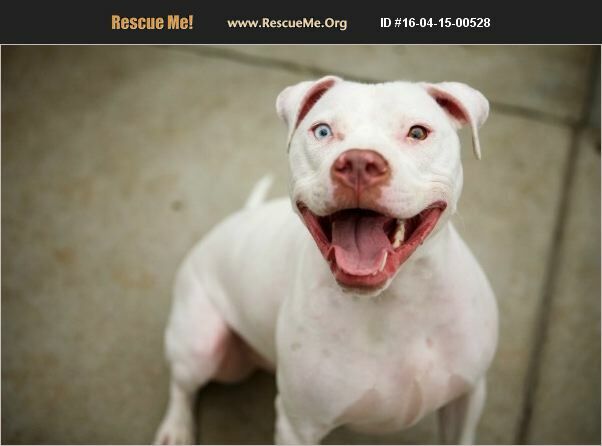 If you think you are ready for this hunk of unconditional love then please visit http://bit.ly/1m78fU5 to complete our quick online adoption application from your computer or desktop (not a phone). Atticus' adoption fee is $200 & includes: Neuter, vaccines, microchip, deworming, a heartworm test, & an offer of pet healthcare insurance for 30-days from adoption date. Thank you!